When Lisa Roberts found a cardboard box of letters and photographs in her attic in Sarnia, Ontario, she little suspected that they held a unique story about the past. The box belonged to Geraldine Rowbottom, who had lived in the house during the 1940s. Contained in the box were seventy-two letters written between 1943 and 1945. The letters were written to Geraldine by a suitor named John C. Waller from Buffalo, New York. Although the letters don't mention how Geraldine and John met, one letter suggests that John's uncle lived in Sarnia. Perhaps they met while John was visiting his uncle. John C. Waller, who went by Johnny, was born in Buffalo, New York, on March 24, 1921. He worked as a sheet metal worker and took night classes, including drawing. 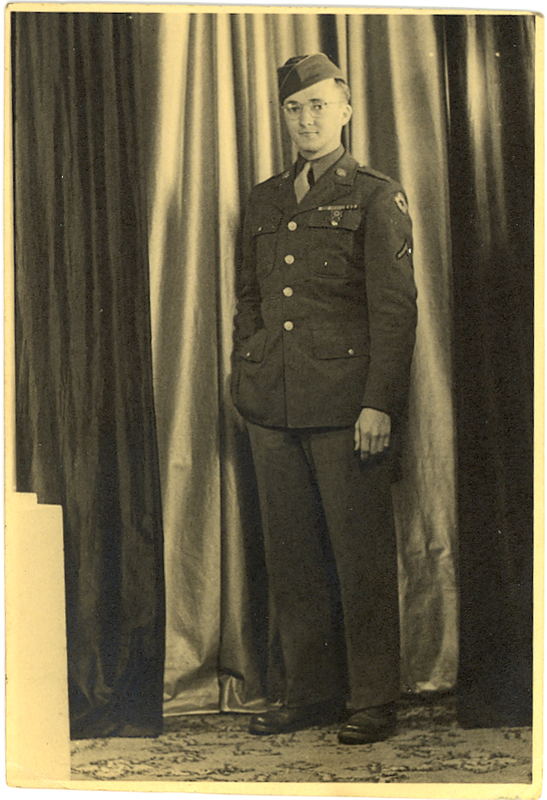 Johnny applied to the Army sometime before April 1943, but wasn't enlisted until September 20, 1943. He hoped to join the Air Force, but was assigned to the 717th Railway Operating Battalion. 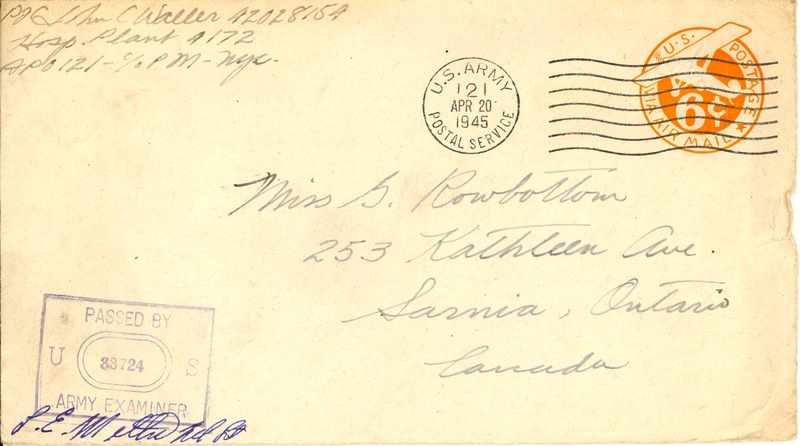 The first letter in the collection is from April 1943. 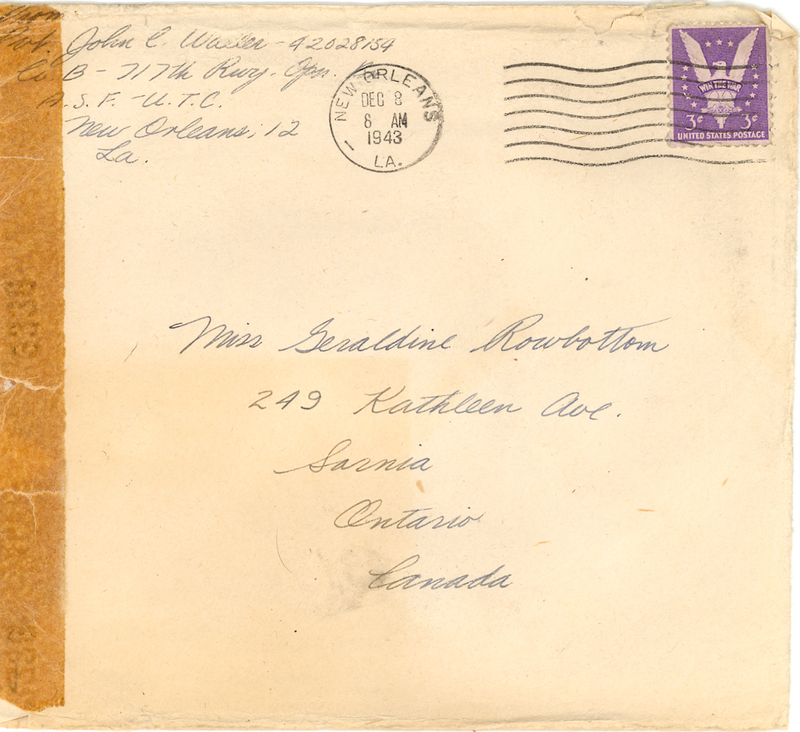 Two more letters from 1943 were sent by Johnny during his time at basic training at Camp Harahan in New Orleans, Louisiana, and his first post at Camp Thomas A. Scott in Fort Wayne, Indiana. During this time, he makes reference to Geraldine's boyfriend, which suggests that their early letters were simply friendly. The 717th was deployed on April 29, 1944. The battalion moved to New York for embarkation to Britain. It sailed on May 12, 1944 on the S.S. Marine Raven, arriving in Glasgow, Scotland on May 24. Beginning on June 3, 1944, Johnny's subsequent letters were sent from the British Isles. Throughout his deployment, Johnny worked on various projects, including train switching, track repair, and hospital train mechanical repair. Each letter was checked by a censor, who stamped the envelope when approved. Johnny was aware of the censorship rules for letters sent home, and made sure to avoid any topics that would be censored. Instead, he wrote about his off-duty jaunts, music, films, and other daily activities. This site was created with the permission of Lisa Roberts, the current owner of the letters, and John C. Waller, the original author.